Are CEREC crowns a good option? I travel a lot, and time to get any kind of appointment taken care of is in short supply. I recently had an emergency root canal done on an infected tooth (one of my first premolars) while I was on the road, and the dentist said I would probably need a porcelain crown. I am home at most for a day during the business week, and my dentist does not work weekends at all. I called their office to see what we could work out, and they said that they have new equipment that lets them place crowns in just a single visit, called CEREC crowns. They said this would probably work for me, but they want to examine me before making the appointment to place the crown. That is OK, as I don’t want them to race into anything and try to place something they shouldn’t just to get it done. My concern is that I have been reading about CEREC crowns on the Internet, and some of the sites are talking about them not looking as realistic as the other kinds of porcelain crowns. I am in sales, and my appearance is critical. I can’t have an obviously sub-standard repair on a tooth making me look cut-rate. My customers are upscale professionals in an appearance oriented industry. 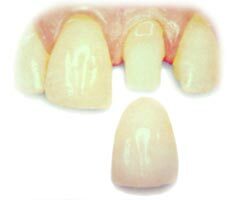 All I really want to know is if CEREC crowns can be made to look as realistic as any other kind of porcelain crowns. It is reassuring to hear that your dentist will not race ahead with the crown appointment before taking a good look at your situation. CEREC crown placement does not work for everyone. The first premolar is visible when you smile, so you are correct in stating that a sub-standard job at matching your other teeth would be noticeable. Your question as to whether or not a CEREC crown could be made to look realistic earns a qualified answer: it depends on the skill level of the dentist using the equipment. You state that the dentist’s office “just” got the equipment, which may indicate that your dentist is not yet very experienced with obtaining optimal results. Ask about your dentist’s training and credentials, and pay particular attention to his or her professional affiliations. Membership or better yet accreditation with the American Association of Cosmetic Dentists (AACD) is a very promising sign that your dentist places a high value on aesthetics. It is also a good idea to ask to see some before and after pictures of actual crowns that your dentist has placed. If he cannot produce any, this could mean that he simply lacks experience with the equipment, and you might be better off with a traditional porcelain crown. You don’t say that the affected tooth has started to darken, so you have time to make decisions. Best of luck. This blog post provided as a courtesy of the office of Lafayette Lousiana cosmetic dentist Dr. Mike Malone. I recently had a veneer put on one of my upper front teeth, and a crown on the other. My gums were really sensitive after the work was done, and instead of improving, they have gotten worse. My gums are inflamed and extremely sensitive to the touch, and this just can’t keep on like this. The dentist who did the work could not fix the problem, so I saw a different dentist, who recommended I see a periodontist, which I did. She treated the gumline, which did not help. Most recently I saw a prosthodontist, who said that the dentist who did the work put the crown too deep and close to the bone. He said that he might be able to improve the situation with perio surgery, but that he cannot “offer any guarantees”, and cosmetic damage to the gum area between my two front teeth is likely to result. Isn’t there any other solution? I can’t believe I have to chose between the health of my teeth and gums and permanent scarring, when I just spent so much to improve my appearance. The problem is indeed the placement of the porcelain crown and porcelain veneer. They are too deep under your gums, which has violated the biologic width of your teeth. Though this phenomenon has only recently been researched, it is disappointing that it took so many professionals so long to determine the cause of the problem. In terms of an alternate solution, it is likely there is not one. You should have the surgery. The situation as it stands right now is not only unsightly, it is dangerous. Left untreated, gum disease can lead to more serious conditions that jeopardize your health. The prosthodontist is being cautious, because he does not want you to get upset if there is indeed scarring. No judicious dentist would ever offer a guarantee, in any case. No procedure can be guaranteed. In the meantime, you might want to consider rinsing with Peridex antibacterial rinse to bring down the inflammation. If you do use Peridex, make sure you also brush with Supersmile toothpaste, as Peridex stains the teeth. This blog is brought to you courtesy of Lafayette Louisiana cosmetic dentist Dr. Mike Malone.